The third day of this year's edition of the Pardes Festival was full of meetings and presentations devoted to various forms of stories about the culture of former shtetls. The presentations such as "Nowogródek - Sztetl na szlaku" [Navahrudak - the shtetl on the road], "Było sobie miasteczko - remiksowana opowieść o Józefowie Biłgorajskim" [Once upon a town - a remixed tale of Józefów Biłgorajski], and "Podróże szlakiem żydowskich miasteczek na pograniczu Polski, Białorusi i Ukrainy" [Travels to the Jewish towns on the threshold of Poland, Belarus, and Ukraine] were given by Tamara Vershitskaya from the Museum of History and Regional Studies in Novogrudok, Belarus, and Joanna Ziętar and Emil Majuk from the "Grodzka Gate – NN Theatre" Centre from Lublin, Poland. 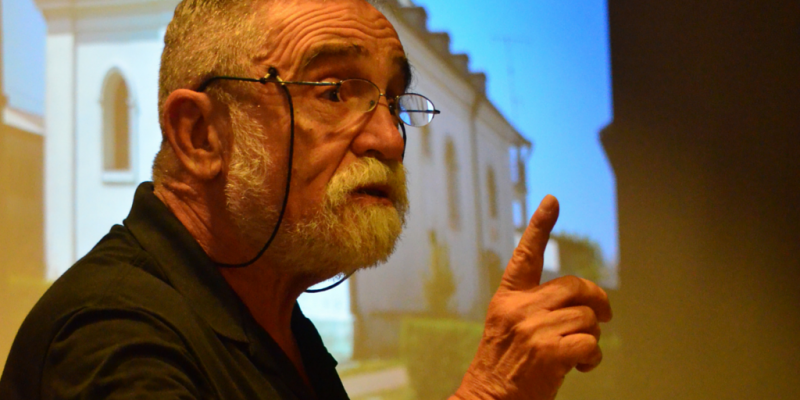 The numerous audience had a chance to see films, archival photos, and virtual models of small towns, and the narration was finished with a mini-monodrama based on the stories from the Memorial Books, performed by Yaron Karol Becker.